Now that it is summer, library time seems more relaxed. Kids meander in, and this summer we have the world’s best cadre of volunteers. A’Miracle was the first kid to arrive. I have known her since she was two and now when we stand back-to-back she is only half an inch shorter than I am. I was so glad to see her wander through the door. 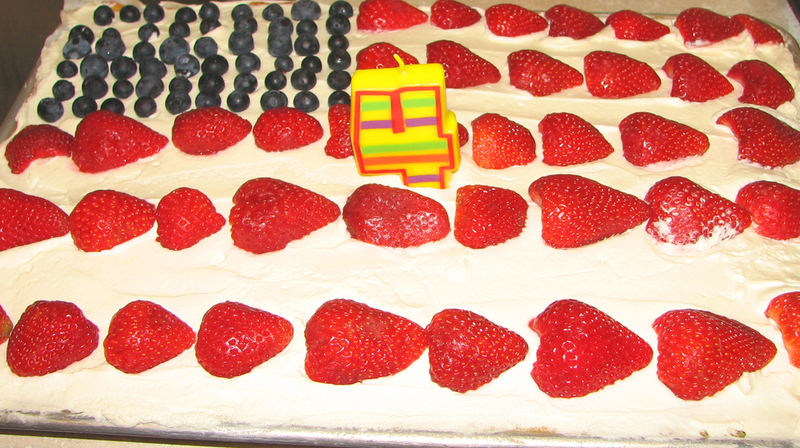 Genia came in carrying her famous fourth of July cake–a scratch cake that puts my weekly box cakes to shame. The icing is whipped cream and being a respectable rectangle, it is prime–at least around the fourth of July–for turning into a flag, which is accomplished with blueberries and strawberries. The kids did the decorating. Heather played with fire and water and a balloon to demonstrate air pressure. We all enjoyed watching air pressure do its stuff. Ariana gave her report about her time at camp. It sounds as if all the kids who have gone so far have had a rip snorting good time. She also turned in her thank you note for the benefactors who made everyone’s time at camp possible. Lots of kids read aloud to Mr. John, Miss Heather, Miss Genia, Hunter and me. Allison oversaw a melty bead effort at a table in the kitchen. Miss Jennifer, now almost as pregnant as one can legally be, cataloged new books. Since her last time at the library she broke her toe and was wearing a fetching blue cloth shoe, but Maya did her one better by breaking her ankle roller skating and showing up in an inflatable boot that goes up to her knee. We had a fine old time at the FPL. I just love summer.